I have always admired the transparency of companies like Buffer and Moz. They openly share data on the development of their business, including their revenue data and salary data. I also greatly appreciate the open approach of Tomasz Tunguz in sharing data about what works for SaaS businesses and the guys at Startups for the rest of us for practical, honest advice. We have learnt a lot from these sites, and we wanted to reciprocate by sharing lessons from our own experience. I first met James & Henley in December 2013, just as the snowflakes started to fall in New York. We agreed to turn the early version of BuzzSumo, which they were developing in their spare time, into a business. We formed the company in March 2014, and during the year we all left our previous jobs to focus on BuzzSumo. We have no investors, I bootstrapped the business financially, and we launched our BuzzSumo Pro product in late September 2014. At the end of 2015, our first full financial year, we had over 160,000 freemium subscribers but more importantly 2,000 paying customers and an annual revenue run rate of over $2.5m. We are also profitable, so overall it was a successful first financial year. How did we do it and what have we learnt? The important thing to remember with any business is that luck plays a part. We were lucky to launch a content marketing tool as adblocking grew and businesses focused more than ever on content to engage with their audiences. Here are 22 things we have learnt during our first full year. Spend every dollar you have on creating a great product–not marketing. A great product will generate far more awareness through sharing and advocacy than any marketing spend. This approach is also far more sustainable as you may run out of marketing dollars. We would never have over 160,000 sign-ups if it was not for the advocacy and support of key industry influencers. Early support for our tool by the likes of Larry Kim, Ian Cleary, Lee Odden, Rand Fishkin, Matthew Barby, Neil Patel, Mari Smith, Mark Traphagen, Buffer themselves and many others that have driven traffic to our site. One of the highlights of my year in 2015 was being interviewed by Jay Baer for the Social Pros podcast. In my view slow growth companies do not suddenly become high growth companies, although there are rare exceptions. You need to be clear on your growth objectives from the start and set clear targets. The key metric to monitor is your monthly recurring revenue (MRR). Initially your monthly growth is obviously very high as you start from a low base. The key is maintaining a good monthly growth rate as you get bigger; we have managed to keep our growth at over 10% a month. Below is our revenue growth in 2015 and how this breaks down between new customers, existing customers and customers leaving (churn). Growing a business with high churn rate (paying customers leaving you) is like trying to fill a leaky bucket, it is hard work. 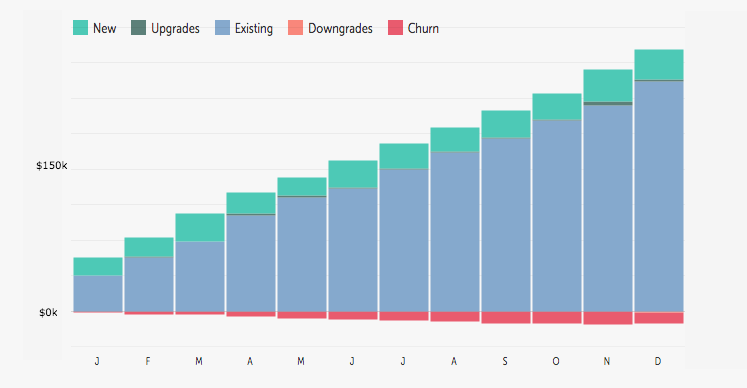 In the chart above you can see how churn has been slowing our monthly revenue growth. We have managed to reduce our monthly churn to below 5%. Your churn will be lower if you become a part of your users’ daily habits or workflow. Tom Tunguz rightly identifies this as a key challenge for SaaS businesses. This is not easy for a tool such as ours, but our trending dashboard shows new trending content every day, our content alerts notify users in real time of new mentions and links, and our soon-to-be-released outreach lists and conversations help users build relationships with key influencers every day. Selling to your existing users can be much easier than selling to new customers. We have developed new value adding features such as our Trending dashboard that shows today’s trending content and Facebook Analyzer which allows you to analyze the most engaging Facebook content for any topic or page. We use these new features to encourage our users to upgrade. There was no one big bang moment for us. Building a business takes consistent hard work. You acquire one new customer at a time, but if they like what you are doing, this gets compounded over time. As you can see below the weekly traffic to our site has risen steadily and consistently. At one level content marketing is simple. You produce regular, relevant content, publish consistently and build an audience. However, building a blog audience, like building a business, takes time. It has taken us over a year to get our blog established, and whilst we still have some way to go, our top posts have performed well in terms of views and shares. Our top content has achieved over 30,000 views and has received over 2,000 shares as shown below. Some of our best marketing content has been the blog posts and reports we have created based on our own unique research and data. Telling stories through data is very powerful whether it is rank order lists or comparisons or trends. My post, co-developed with the Moz team, on the correlation between shares and links was an example of this. You are what you share. Love really is the killer app. Sharing and being helpful is the most effective form of marketing there is. Try to help everyone you can whether they are an influencer or not. We were lucky to have a good balance of skills across the three of us, from backend and server skills, to front end design skills, to marketing and to experience of setting up, growing and selling successful businesses. Without wanting to make Henley and James blush they are simply some of the very best people in the business and what they have achieved with the BuzzSumo product is nothing short of amazing. As we have grown we have employed more staff in Susan, Raymond, Matthew and Michael, who joined us this week. We are still a very small team, just 7 of us from this week, but a smart team that works hard and achieves far more than many teams ten times our size. In my view it is better to wait and get the very best person than make a compromise appointment. A great team member in my view is not just a little bit better than an average person but ten times as productive. We are conscious you can’t achieve everything yourself. We have partnered with companies such as Moz, Buffer, Wordstream, Agorapulse, Uberflip, Canva and many more to run joint webinars which appeal to our joint audiences. We learn lots from these companies, who have been successful in different ways. No one knows more than everyone. You can’t build a business on your own, you need a team and you need mentors. I have been grateful to my long time business partner and colleague Stephen Walsh, Mark Farmer of Eden Ventures, Emeric Ernoult of Agorapulse, Giles Palmer of Brandwatch and many others for their advice and support over the last year. In many ways Tomasz Tunguz is also a virtual mentor to me. We have a freemium product which has helped us grow awareness quickly. We are conscious that free customers may never become paying customers, so conversion rates for these customers can be a bit meaningless, but these customers can be advocates. It also means we give something back to the wider community and individuals. We are very lucky in that our cost of customer acquisition is close to zero. We don’t currently cold call or prospect. We encourage people to use our freemium product and do a free trial of the full product. We do offer weekly webinars but in essence our customer acquisition costs are very low. This is unusual you do need to be aware of your cost of customer acquisition against your lifetime value of a customer. I have seen companies where the acquisition cost erodes profitability. One of the key things we have learnt is that our users often have the best product ideas. Many of the most popular features of BuzzSumo were suggested by our users. Pricing is complex. You need to test pricing. We have not got this right and will continue to experiment. Many of our customers want some of the features of our Agency plan but don’t want to upgrade to a $299 plan from a $99 plan. We should probably allow more flexibility to allow users to upgrade in steps. It’s something businesses need to keep tweaking; I don’t think we’re alone here. You are defined by the experience the customer has in dealing with you. If you only track one customer metric, track your net promoter score (NPS) which is based on a simple question ‘how likely are you to recommend us on a scale of 1-10′. You can use tools like Satismeter to track your NPS, our current NPS for the year is over 50 and the rating frequency breaks down as follows. People will copy you. We have had a series of companies copy what we do, some almost replicating our design. It is flattering, but you have to keep moving and innovating. If your competitors simply copy you, they are playing catch up, and they will always lose. So even if you are on the right track, you have to keep moving or you will get run down. You are not simply building a business but a brand. A brand has a tone, an emotional appeal. In creating our BuzzSumo brand, we have invested in creating a Sumo character and unique artwork for our blog posts. Hopefully this makes our content distinct and provides a certain humour and tone to our work. Everybody can become obsolete, even you. You have to keep learning every day. Are your skills and experience should be more valuable today than they were last year? What did you learn last week? There has never been a better time to start a SaaS business as you can use great tools for next to nothing. We use Intercom, Xero, Hipchat, moving to Slack (isn’t sending emails quaint? ), Stripe, FullStory, Satismeter, Buffer, Agorapulse and many more great tools that can grow with you. For us a right hook was when Twitter suddenly turned off their share count API. This prompted a major change in our approach and led us to purchase data from Gnip and actually get to a better place with our tool. Be flexible, stuff happens. Be resilient too – you need to be able to take the punches and recover quickly. Thanks for sharing this Steve and congratulations to you, James and Henley! I was privileged to hear about some of your growth tips first-hand when you came in to talk to our team and I know they will enjoy reading more about them. That is so amazing and encouraging. Thank you so much for sharing. The best part is that “stuff happens.” I hope we will be able to remember that when challenges come. (we are just beginning to build our organization). What a refreshing and interesting post, Steve. It’s great to read about your successful growth and how you sidestepped, and indeed profited from, the various challenges. As you say, ‘stuff happens’ – and it’s the mark of flexible, entrepreneurial thinking that sets you apart from people who would panic, get stuck in ‘why us?’ thinking, or run for the hills! May 2016 be another year of growth and exciting change for you all. I went to bed last night with a cluttered mind. “Is this a good idea?” “Is this worth it?” “Am I spending our dollars in the right places?” I mean, yes, I ask these questions often, but last night, in particular, was a tough night. THIS just made my day. This is simply awesome, refreshing, inspiring and motivational. Kudos and congrats on all your success. Keep it going!!! Great post! Thanks for sharing your learnings and for being so specific with your advice. “A great product will generate far more awareness through sharing and advocacy than any marketing spend.” But my professional reaction to that statement is that that is marketing (PPPP) I suspect you mean ad spend? Wow! I love this post. I love the details about the challenges you faced while growing the company. I think the best takeaway anyone can grab from this post is that building relationships and partnerships (both influencers and your customers) is key to continued growth. But I’m shocked at your team numbers. Are you really only (recently) 7 people? Fantastic job! Hey guys, that’s awesome – thanks for sharing! It’s also great that you’re profitable; I’d recommend stay that way and shy away from the bubble-like attraction of high investment growth 🙂 Go hard, and all the best for 2016!! Also have to add, kudos to Brandon and Susan for their great sales efforts – gotta love the personalised approach. It works far better than sending a whole load of generic autoresponders and follow-ups 🙂 Yep, I signed up. Great post Steve and many congrats on the success – totally agree with the ‘Employ the very best staff you can afford’ mantra! Something I have seen proven many times over with the businesses I have been involved with. Thanks for sharing. I remember when you were first starting out. Great to hear how you’ve converted the freemium to paying customers. This is exactly what I need right now given that I’ve just launched SEO Point and need memberships. Was it a difficult decision to offer the free trial? I see you’re only converting 1.25% into paying customers. That seems incredibly low? Great stuff, Steve. You guys make a great product and offer stellar service. I wish you many more milestones! Wow, thanks for the insights. I learn a lot from this blog post. My plan is to grow my startup http://sociocaster.com to a saas business which really give lots of value added by the end of 2016. Steve, wonderful post. Each paragraph stands on your knowledge of people and your attitude. You clearly found out what your users need, and try to provide a service with them in mind without trying to screw them over. The stunning steady growth of MRR proves you are doing it right. Great post Steve. Thanks for sharing. For us getting a 100+ share is a big deal. How can BuzzSumo help us? Can you lead me to someone for a demo? Great and very inspirational post. Thank you! amazing growth from a team of just 7, wow! Great insight. I love buzzsumo because anyone who is serious about latest content marketing strategies must have buzzsumo. Recruiting is the longest process to grow the team, but if you chose the right people, they’ll be worth every penny. Just watch for team chemistry too – sometimes it suffers from hiring too quickly or the people just don’t “mesh”. Fantastic article Steve! As a SaaS business owner, I resonate with so much of this and I also have a crap-ton of inspiration moving into 2016 for where we’d like to go as a company. Cheers my friend! Thank you for sharing your lessons learned with the world. I found the post helpful and inspiring. Cheers to another prosperous and insightful year! Congratulations on your first year and your growth. I love using BuzzSumo but I am one of your freemium members as I am not a marketer and do not work for a big company who will cover membership costs for me. I own a small business and do my own marketing and SEO in amongst the hundreds of other jobs involved in running your own business. It would be great to see a pricing structure which would allow small business owners to have full access to your features. Maybe a pay as you go system of some kind? I would happily pay for a day’s full access a few times a year. But I can’t justify a fairly large monthly cost for something I would only get chance to focus on for a handful of days each year. I think you could reach a whole new (and rather large) market if you offered a small business owner friendly solution. An excellent post with a ton of actionable value. Great job guys and solid breakdown. Thanks for sharing this Steve. It’s amazing how a great product like Buzzsumo was built and grew by such a small team. Congrats! I plan to purchase Buzzsumo soon. Thanks for the insightful post. Great article Steve! Congrats to you and the BuzzSumo team! Thanks for sharing. It’s a impressed post for me. Excuse me. Can I translate to korean language for my blog? I’ll include your post URL address and not a premium bloger. I have to add my thanks to the growing list here. Great post. Also particularly resonating with me as Majestic has a very similar business model as you know, Steve. I don’t think Alex would let me share our numbers quite so much, but you never know. The other lessons I think are pretty much spot on. If there is one I can add… Watch out for all those mounting free users. They cost, and once they have decided free is fine, you’ll have a devil of a job removing that overhead. The more I analyse it, the more I see it is a lot more than costing me “just a bit of bandwidth@”. But you are right – these are also potential advocates that can more than pay there way. Filtering the advocates from the dragvocates (a new word!) is part of my January resolution. Great thoughts and insights, as a SaaS business owner I am at a crossroads. It is an exciting time for me but also scary as hell. Your thoughts are well timed and greatly appreciated. Great article. We are currently developing new SaaS products and I will keep this as a checklist. Steve, awesome post and great tips! Quite an amazing story.. I would love to hear more insights about decisions and objectives behind the freemium plans – like impact of the free plans to growth, buzz and conversion to paid users. Great article..! Really enjoyed reading it and congrats on your accomplishment. It’s nice to see that small teams can make big things happen. Excellent article. It reminds me so much of our early experiences with our new SaaS product (https://partial.ly – payment plan software). We’ve counted on a variety of other SaaS products to help grow our business. There are only a few partners in our team, but with the help of excellent SaaS products such as Slack, MailChimp, LiveChat and ZenDesk, it has been easier than anticipated to reach almost 400 signups in just a few short months. 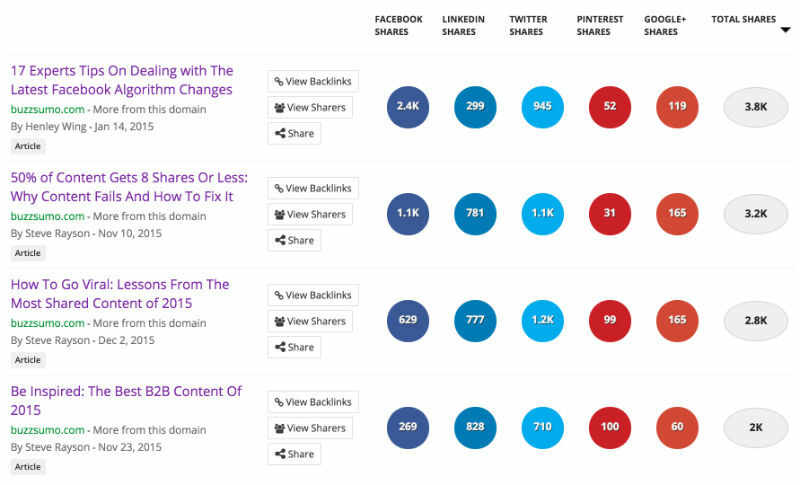 I’m just getting into content marketing and will surely be taking advantage of Buzzsumo. Do you have any other great SaaS products you could recommend? Amazing article, Steve. Keep the hard work here at Buzzsumo ! Great article and great transparency. What were some of the key KPIs and goals you were tracking that helped you get to where you are?